I was laughing so hard there were tears running down my cheeks. I read this from cover to cover-no way I was stopping until I hit THE END!! Jill Storm's ex husband was now a woman--her son was a wanna be artist--her Dad was in jail for committing white collar crimes and her Mom--well let's just say she is hilarious--as long as she isn't YOUR Mom!! Of course I have one almost as nosy and manipulative. Jill just happens to be a sou chef at a prestigious hotel in Las Vegas but that isn't going to help pay for college tuition for her soon to be college bound son. Then imagine turning 40, being in semi menopause and deciding you really need to find a husband to help pay for college for your son. She sends out a questionnaire to happily married woman and tries to go from there. Enter her son's third grade teacher who is totally unacceptable. To add to the merriment add in 4 wonderful friends who all try to help each other out--or at least help drink each other out of their misery. This is the author that also wrote Chasing Charlie - another novel that had me laughing - you can see my review of that here. If you like to laugh--really laugh then you have to read Kathy Carmichael's novels!! What's the recipe for a happy marriage? That's what chef Jill Morgan Storm wants to know, and according to responses to the "Marriage Satisfaction Surveys" she and her closest friends cooked up, the answer is to marry a traveling salesman who is rarely home. And Jill certainly deserves some happiness, after everything she's been going through. Her teen-aged son, who only speaks to her in French, needs college tuition. Her crazy mother is determined to find her a man—and only brings her unsuitable ones. A pesky schoolteacher keeps annoyingly trying to fix her life. Her sous chef job is in jeopardy, and, most aggravating of all, her ex-boyfriend has absconded with her favorite skillet. What's a single mom to do? Faced with the answers to her surveys, she sets off to find the traveling salesman who can share her dreams. Along the way, can she find herself and a man who will claim her heart? 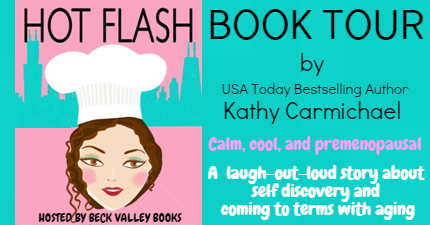 "Witty dialogue and wickedly funny characterizations make Kathy Carmichael’s Hot Flash a jewel among romantic comedies. Great fun!" 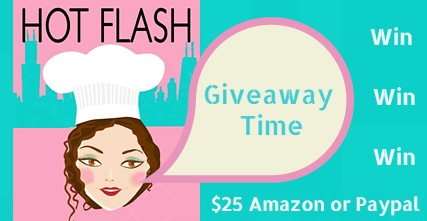 "Hot Flash is a keeper! It has heart, and I’m going to read it again. And again. Wonderfully well done! "I have never laughed or cried so hard as I have with this truly wonderful book!" USA Today Bestselling author Kathy Carmichael resides on the west coast of Florida with her Scottish husband, two not-so-wee sons, three cats, a part-time dog, and a huge collection of dust bunnies. Kathy writes award-winning romantic comedies and humorous mysteries. Her Texas Two-Step romance series is a reader favorite. 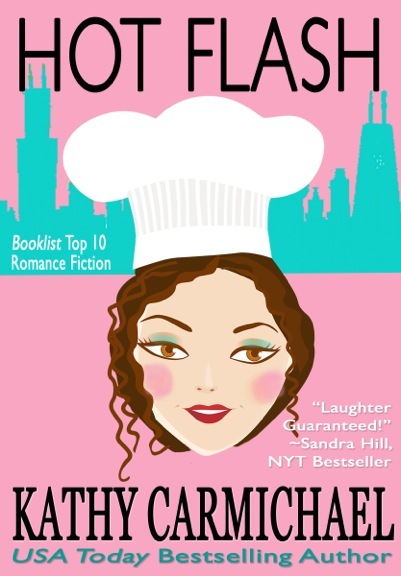 Kathy's romantic comedy, Hot Flash, was named by the American Library Association's BOOKLIST magazine as one of the Top 10 Romance Fiction titles for 2009. In addition to her novels, she’s sold short stories and wrote a bi-monthly column on the business of writing for a national writing trade magazine. Kathy is also a contest judge for Writers Digest. 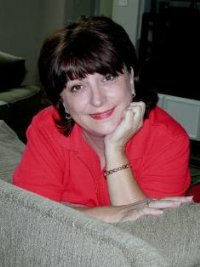 She’s a member of the International Thriller Writers, an active member of the Mystery Writers of America, Sisters-in-Crime, Novelists Inc., the Florida chapter of MWA, is the published author liaison of the Tampa Area Romance Authors, and is an active member and past national board member of the Romance Writers of America. Kathy loves hearing from readers. A special fun survey has been prepared to accompany the book. You can take the survey or read the responses HERE. I receivd an e-book copy of this book for review purposes. All opinions expressed are my own honest opinions. For more information please check my Disclosure Statement. Our giveaways are in no way sponsored or promoted by Facebook. This sounds like a fun read! It's perfect for me to read while I am at the beach!! This looks like the perfect book to read on beach days! It sounds like a fun, light read, which I could definitely use in my life right now ;) Thanks for sharing! Thanks for the book suggestion. I'm going on a short trip this week and this will be the perfect book to take with me! Like the sound of the book. I will definitely be adding this one to my collection. I love books that have you in tears for laughing. My friends and I used to always say a happy marriage would be best with a traveling husband - luckily I ended up with one that we are more miserable on his rare occasion of traveling! This was such a fun read, the second book I have read from the author and enjoyed both. I think my ideal man would be Daryl from walking dead. This sounds hilarious! According to quizzes, my ideal man is Ryan Gosling lol. Interesting play on words with the title. Might be a book that my wife would enjoy! My ideal man is Kim DeLury (from Witchblade tv series). Oh this sounds like a terrific book for my upcoming trip. I love to read good, funny books on a plane, makes the time fly by. That sounds like a fun read. I love when books capture you from the first page. Oh my goodness! I'm so glad you enjoyed Hot Flash and that it made you laugh! Thank you so much for reading my book and for the fabulous review! I remember those hot flash days well and am glad they are over. What a fun book this sound like to read. I get so sick of those shootem up bang, bang books that this would be a nice change. What a fun sounding fun! I can't wait for summer and the chance to read more books like this (instead of textbooks). This one just has to be funny. I can't wait to start reading it. Hot flash has an interesting plot. It would also be nice to note how each character would interact with each other as the story goes. Looks like a great book!! Definitely going to add to my reading list! You make it sound more than fabulous, and I can't wait to get a copy! Looks like a nice book if you're looking for some fun. I like light readings, nothing serious. My guy is pretty much my ideal. It took me years but I found the right one for me. My ideal man would be a true gentleman and have a great sense of humor. I could definitely use an entertaining book to read and this looks like it would fit that bill perfectly. I need a good humor book in my life. This sounds like an excellent read!! This sounds like a great read!!! I love finding new books for our trips to take along and read! This sounds really funny! I'm sure I would get a kick out of reading this one. Oh my goodness, this sounds too funny. I could use something light-hearted right now. I could use some light reading. This sounds like a good choice. You're growing my book list daily friend. I don't think we realize how close are to that Hot Flash point... EEK! I think this looks fun! This sounds like such a fun book to read. Thanks for sharing. Hot Flash, I think my sister in law would love to read this one. Sounds like fun! sounds like so much fun! great suggestion! This sounds so funny! Though I'd be super frustrated if my kid insisted in speaking only in French to me! This sounds hilarious! I can only imagine what I will be like at that age! I'm married to him, he is right for me. Ohh sounds really a good one - I would love to have my take on this, hihi - thanks! These books sound amazing and everyone could use a good laugh I think. I am going to have to check these reads out indeed. Thanks for sharing. Sounds interesting. Thank you for sharing! I might check this out real soon! I read Chasing Charlie. Awesome book. I will have to get this one. My ideal man would be good looking, funny, moral and loyal. Lucky me, I found him and 17 years later we are still together. Sounds like an interesting book. I have been stuck in my book the last few days. This sounds like a great book. I am going to have to pick up a copy! I love that this book made you laugh so hard. They say laughter is good for the soul. This sounds like a super fun read. I 'd love to get ahold of a copy! Thanks for sharing. Sounds like a fun book with a lot of humor. I need more laughter in my life, helps take the edge off stress and feels great as well. I love humorous reads like this. Would be worth reading from cover to cover. A good friend of mine would love to check this book. Looks interesting perfect for relaxation time. This sounds like it would be a very good book. Something besides the usual horror that I read. What a great read! I'm sure it's a hoot - thanks for the book suggestion! My ideal man is my hubby. He loves me all the time, no matter what. My ideal man is someone who is my love, my companion, and my best friend. My ideal man would be smart and funny and not stupid. My ideal man is my husband! Strong and supportive! He should be respectful, faithful, hardworking, and easy to be with.